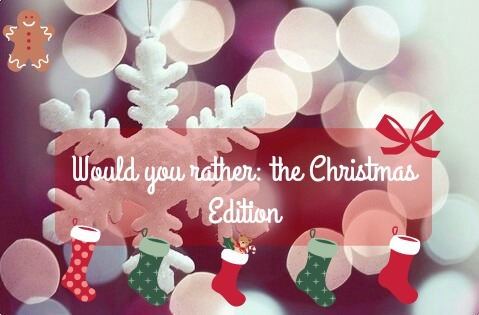 I'm feeling extremely christmassy today and I cannot wait for the real festivities to begin this weekend as I'm currently on my way home for a weekend of festive fun with the family, so here's a Christmassy would you rather tag to help you feel more festive today!! 1. Have to loudly sing the chorus of “Jingle Bells” every time you walk into a room for a week or have to wear a Santa suit to school/work every day for a week? Wear a Santa suit every day for a week for sure! Make presents for my family - it's more meaningful! Not celebrate my birthday! Christmas is way better! Fingernails that light up like Christmas lights!! Be at home - there is nothing better than being at home with my family during the festivities! Live in a giant gingerbread house! Write a five-paragraph essay for sure! 12. Have a nose that glows red like Rudolf’s or have pointy ears like an elfPointy ears like an elf! £1000 before Christmas to use to buy gifts for other people - I LOVE buying presents! Have a job wrapping presents! Dance in the Nutcracker - I miss dancing! A day Christmas shopping for sure! So there you have it - if you decide to answer these questions, leave a link in the comments below :) I hope you're all feeling as Christmassy as I am!